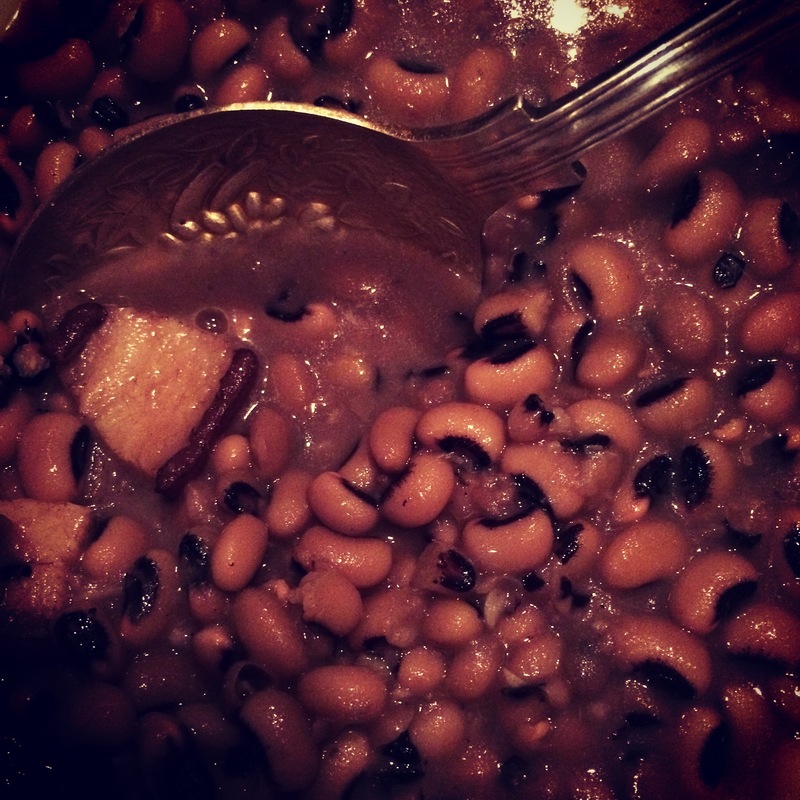 Home › art › Hoppin’ John: Eat poor on New Year’s Day, eat rich the rest of the year! Hoppin’ John is found in most states of the South, but it is mainly associated with the Carolinas. Gullah or Low Country cuisine reflects the cooking of the Carolinas, especially the Sea islands (a cluster of islands stretching along the coats of south Carolina and northern Georgia). Black-eyed peas, also called cow peas, are thought to have been introduced to America by African slaves who worked the rice plantations. Hoppin’ John is a rich bean dish made of black-eyed peas simmered with spicy sausages, ham hocks, or fat pork, and rice. In Africa, where the dish originated, beef would have been the meat of choice according to historian, Suzannah Miles. There are many variations to traditional Hoppin’ John. Some cook the black-eyed peas and rice in one pot, while others insist on simmering them separately. Some also like to add the collard greens in the pot. The favorite way to eat a Hoppin’ John meal is with collard greens and corn bread. Each item on the plate has symbolic meaning for the New Year. Black-eyed Peas represent “coins,” collard greens represent money or “green backs”, corn bread represents “gold,” and if tomatoes are added to Hoppin’ John it symbolizes “health”. The first written recipe for Hoppin John appeared in The Carolina Housewife in 1847. Most food historians generally agree that Hoppin John is an American dish with African/French/Caribbean roots. There are many tales or legends that explain how Hoppin’ John got its name, but writer, historian Suzannah Miles has proposed the idea that the name comes from a paraphrased Gullah version of the French words for pigeon peas, pois pigeons, pronounced “pwa-peejohn.” Totally makes sense. Here is some of Suzannah Miles’s writing on Hoppin’ John from Charleston Magazine last year. Black-eyed peas are traditionally used in Charleston hoppin’ John, yet field peas, crowder peas, and even kidney beans may be employed. The peas are accompanied by long-grain white rice. Some people serve the rice and peas separately; others cook the two together. The oldest Lowcountry recipes call for adding fried bacon to the mixture. And in addition to the shiny dime, another tradition calls for each person to leave three peas on the plate after finishing, with one each to represent luck, wealth, and romance.” Thank you, Suzannah! This African-American dish is traditionally a high point of New Year’s Day, when a shiny dime is often buried among the black-eyed peas before serving. Whoever gets the coin in his or her portion is assured good luck throughout the year. For maximum good luck in the new year, the first thing that should be eaten on New year’s Day is Hoppin’ John. At the stroke of midnight on New Year’s Eve, many southern families toast each other with Champagne and a bowl of Hoppin’ John. If it is served with collard greens you might, or might not, get rich during the coming year. If you eat leftover Hoppin’ John the day after New Year’s Day, then the name changes to Skippin’ Jenny since one is demonstrating their determination of frugality. Eating a bowl of Skippin’ Jenny is believed to even better your chances for a prosperous New Year! – Source: Beyond Black-Eyed Pease: New Year’s good-luck foods, by Mick Bann, Dec. 26,2008, Austin Chonicle. Charlotte i had blackeyed peas and bacon in the morning and blackeyed peas and ham hocks in the eveing tho’ no cabbage-next year!